The Nanaimo RCMP is investigating the attempted theft of over 900 dollars of merchandise from the Real Canadian Superstore in Nanaimo. The incident occurred on Tuesday April 11 and involved 3 adult females and 1 adult male. 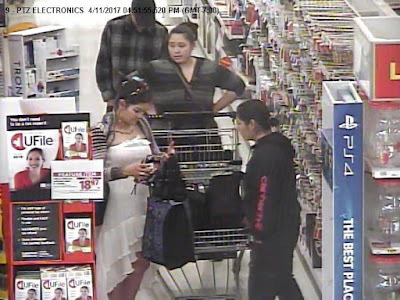 Police were called to the business at approximately 5 pm on Tuesday April 11, 2017 when the four individuals shown in the attached photo, managed to leave the business without paying for a shopping cart of meat products and electronics. When confronted by a Loss Prevention Officer the cart was abandoned and the four left the area in a small grey car. Attached are still photos of the suspects. 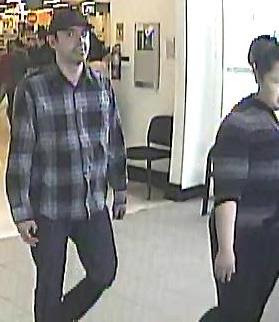 "The photos have been distributed within the Nanaimo RCMP Detachment and the four suspects were not identified. For this reason, we believe they are from another jurisdiction somewhere on the Island," said Constable Gary O'Brien of the Nanaimo RCMP. If you have information on the identity of any of these four, please call the Nanaimo RCMP at 250-754-2345. If you wish to remain anonymous contact Crime Stoppers at www.nanaimocrimestoppers.com, text 274637, keyword Nanaimo or call 1-800-222-8477.